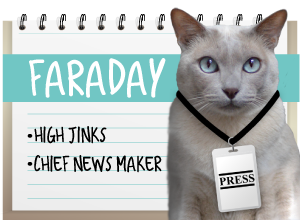 We got the idea for this one when we accidentally stumbled on it while researching last week's trivia: "all cats are grey in the dark." 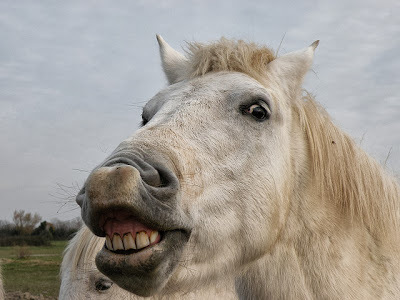 "No man ought to look a given horse in the mouth." "Ah-hah!" we thought. "We just found the origin of another saying!" Boy, were we wrong. But hey, we were only off by about, uhh...let's see...1,100 years, give or take. "Noli...ut vulgare proverbium est, equi dentes inspicere donati"
"Do not, as the common proverb says, look at the teeth of a gift horse." A Practical Guide to Lexicography, Piet van Sturkenberg, John Benjamins Publishing, 2003. Page 100. Haven't you ever wondered if a humor writer comes up with a great idea that gets rejected? Yup. All the time. Sometimes it's because the humor's just a bit too edgy for a Hallmark card. Yes, that's actually what the Shoebox team has been calling these rejects for the (many) years our mom has worked there. "Funny, but no" is a legend around Hallmark. So we thought we'd add some of these "rejects" into the 'Toon Tuesday rotation. 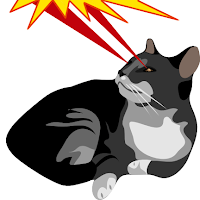 Monday Medical: Why do cat's eyes glow? Many of you have seen the recent article that's been making the rounds, where photographer Nickolay Lamm produced a series of photographs that are his visual interpretation of the way cats see differently from humans. It's hit all the major news outlets - Huffington Post, NBC, Wired.com, and others. While I'm not completely convinced of its accuracy, it did spawn a lot of discussion. 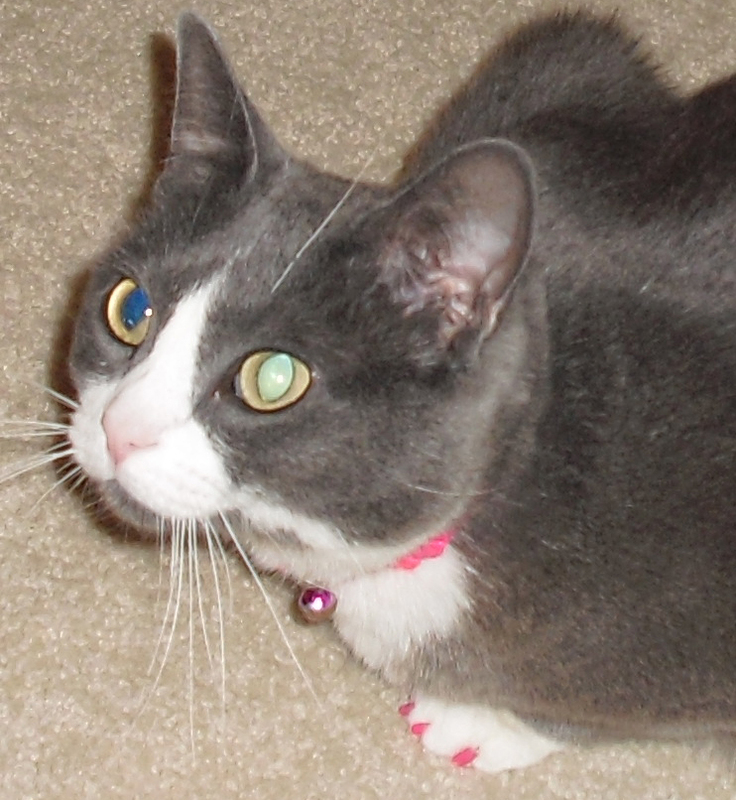 So I thought I'd add to the discussion by re-running an article from last summer on why cats' eyes glow in the dark. It was a lot of fun to research and write. Enjoy! If you’ve taken many pictures of your dog, cat or ferret, then you’ve seen it: laser eyes! It’s a phenomenon specific to only a handful of animals; other species like rabbits, guinea pigs – even humans – just don’t genetically have that "special glow." Those that do are gifted with a unique surface in the eye behind the retina called the tapetum lucidum. This special surface is composed of 15 layers of glittery cells that combine to create a single reflective layer to capture and enhance light. Any light that gets past the retina is bounced back at it, giving the photoreceptors in the retina more data - and a second chance - to resolve the image. Basically it functions a bit like nature’s very own night vision goggles! Cool, huh? glow red instead of green? I had never really paid any attention to the color of the boys' eyes when they glowed until someone mentioned this to me. 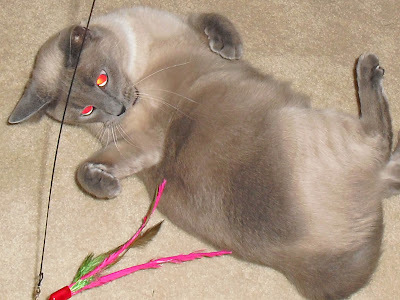 The claim was that Siamese eyes glowed red while all other breeds glowed green. Of course, I had to test this empirically. So out came the el-cheapo camera (you know, the one guaranteed to get the bad photos - and red eye - every time!). Seriously red eyes! We were shocked at how red, in fact. Of course, that begs the question, what causes this? Contrary to what Wikipedia states (you do know Wikipedia can be wrong, don't you?) 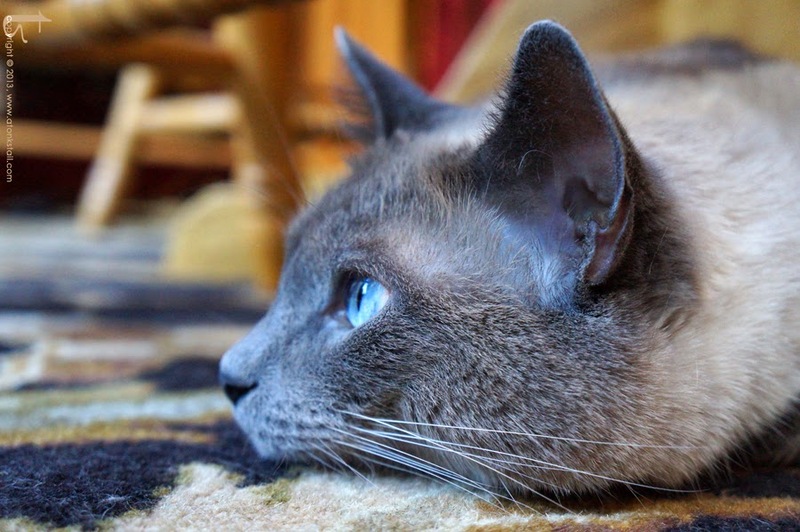 Siamese cats do have that cool night vision layer behind their retinas. 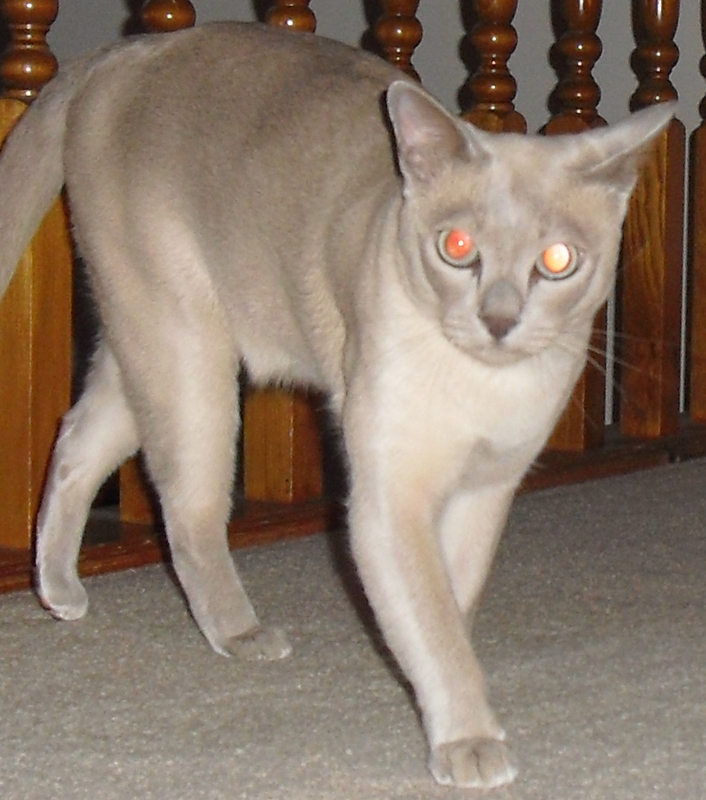 But unlike other breeds, there is a hereditary abnormality in Siamese that weakens the tapetum lucidum. 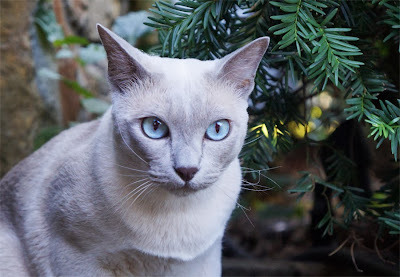 So a Siamese cat probably won't see as well in the dark as other kitties. 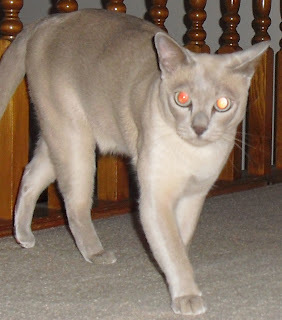 Since Faraday is a Tonkinese (a blend of Siamese and Burmese), you'll notice his eyes are less red than Maxwell's. He probably sees better at night that Maxie. 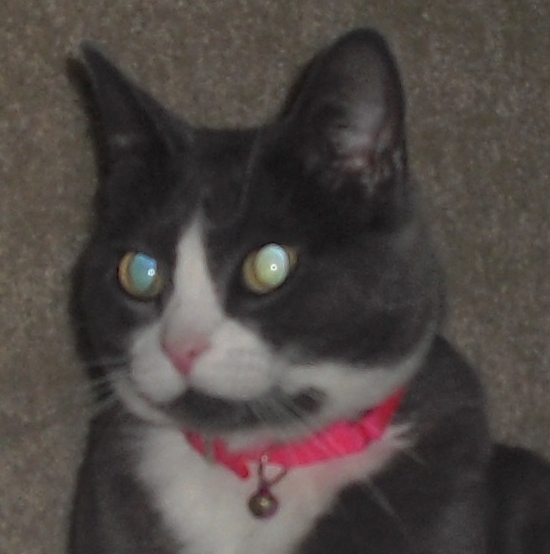 Cats: cool, built-in night vision goggles. The cake. The walk. The indignity. Tah-dah! Allie got her cake! 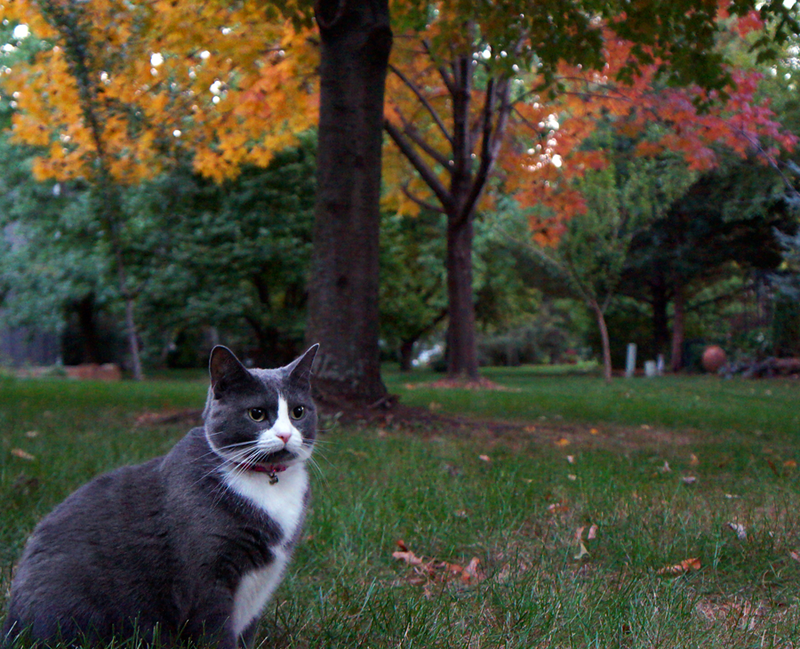 And she (finally) got her promised constitutional - can anyone say Fab Fall Foliage with Feline? ...and then we went inside to inspect the cake. Allie's a bit perturbed. Seems the cake is pumpkin. She's wondering if there's a message in here, about aging girlcats and, err...well...the need for pumpkin in one's diet...? 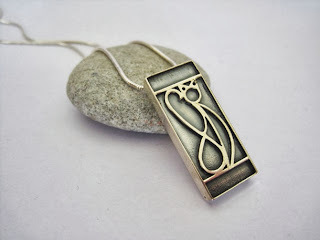 We apologize for being late posting today - someone (whose initials are M.O.M.M.Y.) is running around preparing her materials for the Cat Writers' Association Conference this Friday. Not that it's any excuse whatsoever. But I digress! 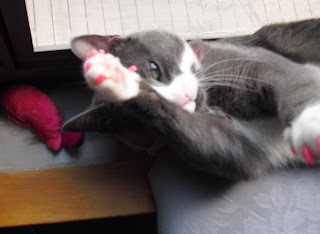 I dutifully brought to her attention that she was delinquent with today's post, and what does she do? 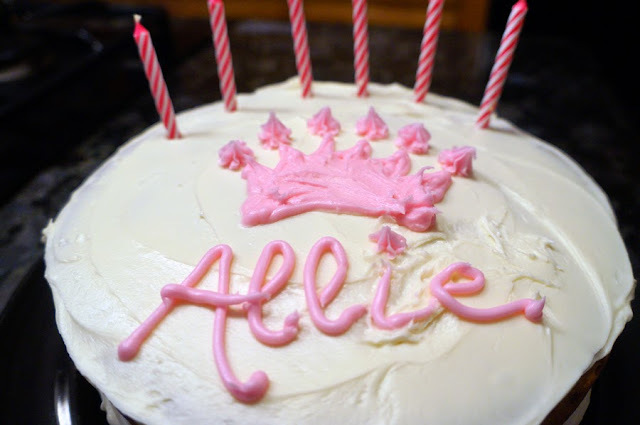 Rushes around muttering about baking Allie's birthday cake. To which I reply (in a quite rational tone) "but mommy, her birfday was FRIDAY. Today's the day after Caturday." Which just made her act even more crazy. HUMANS! 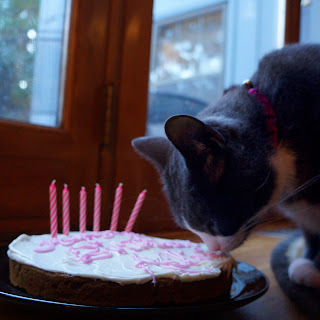 So until Mommy gets her act together and posts Allie's party pictures, you'll just have to tolerate yet another photo of Allie enjoying her special birthday gift from Mr. Chewy - cans of Merrick grain free cat food. 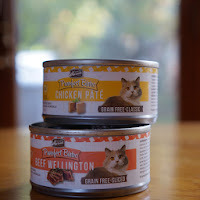 They gave her two cans of Beef Wellington - which she adores because she's snooty that way - and two cans of Chicken Pate (which I stole cuz it's character building for her to learn to share). 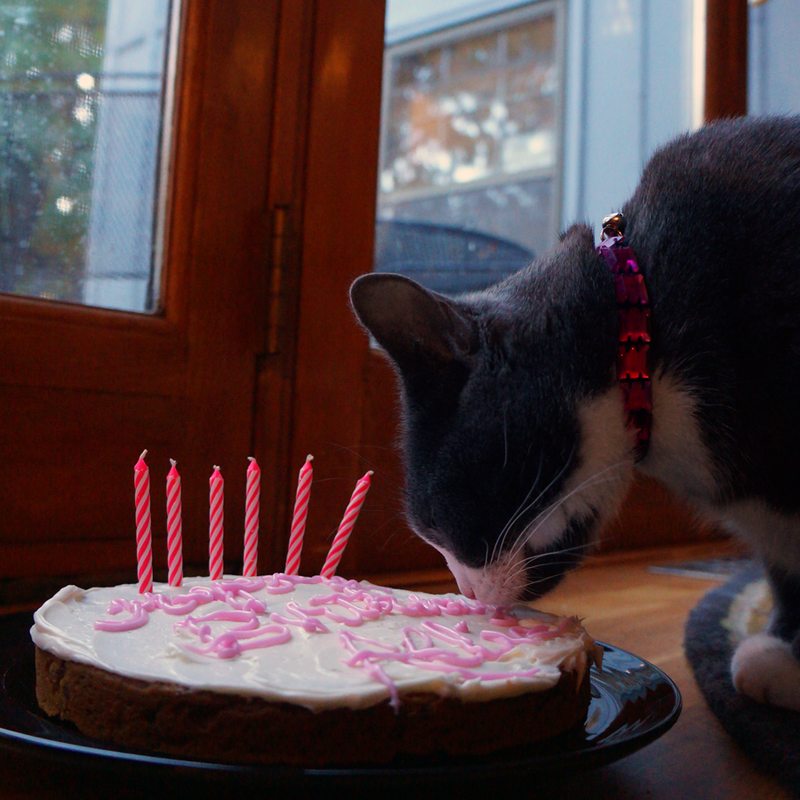 Here she is stuffing her fat face enjoying her delicious birfday dinner. In her fancy silver footed bowl. Yeah, she's snooty that way, too. Mommy likes the fact that Merrick makes all their own food and it's 100% free of ingredients from China, and if you've been watching the news lately, you know how important that is. 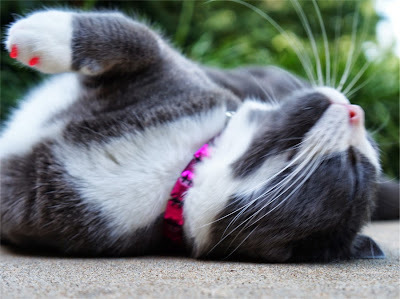 Just last week, the FDA released an update on their research into pet treats from China that have caused over 3,600 dogs and cats in the U.S. to fall ill, and almost 600 to die. Bottom line, there are still no solutions, and it's imperative that pet owners actively avoid foods with ingredients from China until this plague of bad pet food has been resolved. So Merrick made a good first impression with her on that count! 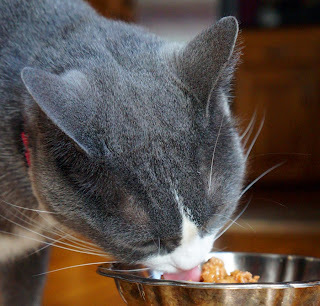 Merrick also lists a minimum of 9% animal protein (which is good since cats cannot properly digest plant protein and cheaper pet food brands are notorious for upping the protein percentage by sneaking plants in!). 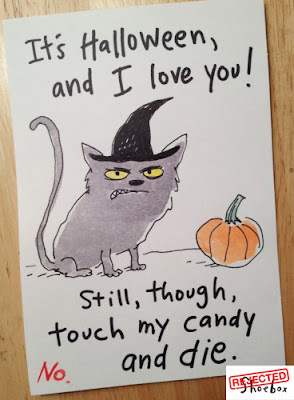 And we're 100% supportive of grain free and wet foods for cats. Nah, the innocent angel look isn't working for us either! Check, check and check. The only complaint we have at our home is with a certain blue-eyed Siamese who refuses to part with his dry food. It's a good thing Chewy carries lotsa grain free brands, cuz we're still looking for that canned food that'll break Maxwell of his kibble habit. We're wide open to suggestions. 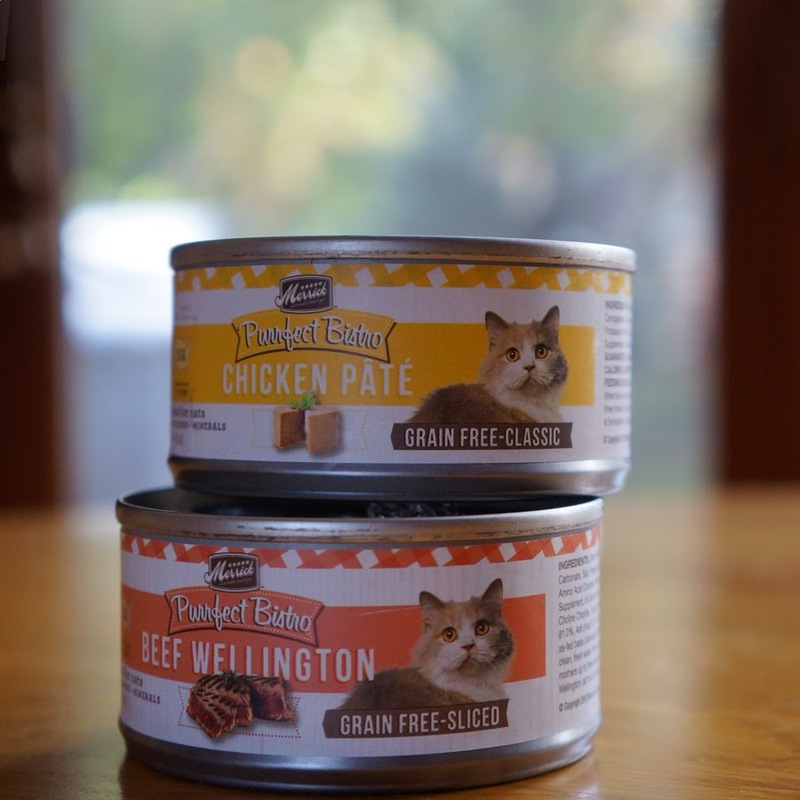 Chewy.com graciously gave us the cans of Merrick cat food to review but we were not compensated for writing this post. All opinions are our own. As in, "I refuse to stir from this spot. I don't wanna go in. And you can't make me!" 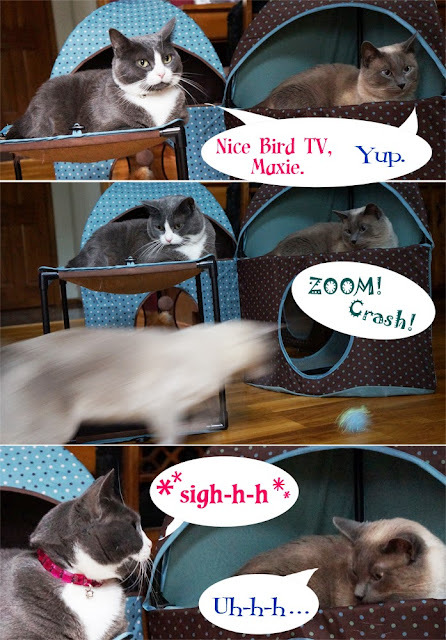 ...and the Saturday Pet Blogger Hop! 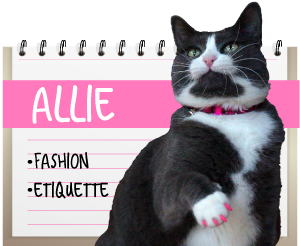 Allie was most probably born in October of 2007. So we've chosen today to celebrate. This makes her 6 years old this year! who terrorized her older brother Ryker into a proper little lady! already charming her new daddy! 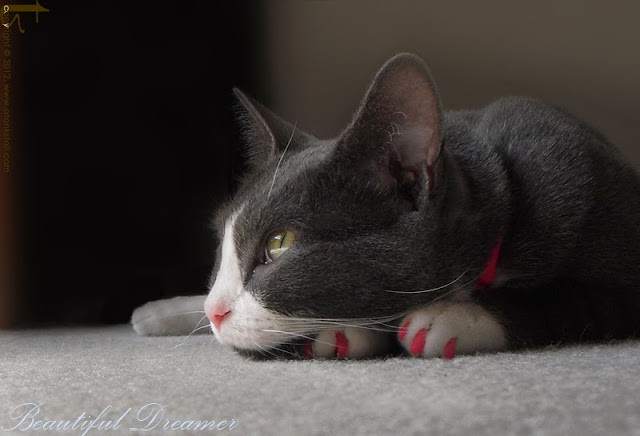 When someone uses the phrase, “all cats are grey in the dark,” they're telling you that what you can't see won't influence you. Darkness can serve as a great equalizer, preventing one from judging based on appearances. So how did the cat get dragged into this saying, and by whom? “…it is impossible of two Women to know an old from a young one. "…it may be that Sancho the squire will get to heaven sooner than Sancho the governor. ‘They make as good bread here as in France,’ and ‘by night all cats are grey’ … for when we go to our graves we all pack ourselves up and make ourselves small, or rather they pack us up and make us small in spite of us, and then — good night to us." But you need to go back yet another hundred years to arrive at its earliest known use in print. Many reputable scholars believe this was penned by an entertainer in the royal court of Henry the Eighth - a man by the name of John Heywood. 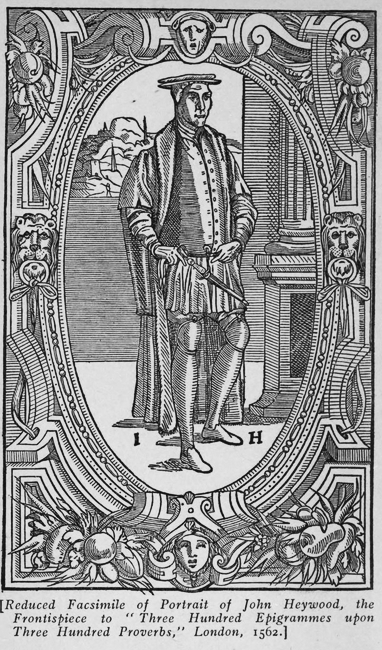 Heywood gathered proverbs and wrote plays in his spare time. One such book published in 1546 was a 200+ page collection of proverbs … on the topic of marriage! We'd like to tell you our research ended there, but we did find one reference that claims the saying was included in a book of proverbs compiled by Dutch Renaissance humanist and theologian Desiderius Erasmus - published 10 years earlier (1536). As the book, entitled Adagiorum chiliades (or "Thousands of proverbs") is considered by some to be the most monumental collection of proverbs and sayings ever assembled, we won't argue the point. But after some pretty long searches we gave up on trying to find the exact quote. Of course this might possibly be hindered by the fact it was written in Latin and we're only fluent in English and Kittenese! 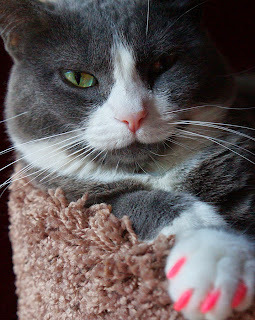 Allie is of the opinion that "all cats are grey in the dark" implies that all Fashionable Felines are of the grey persuasion. 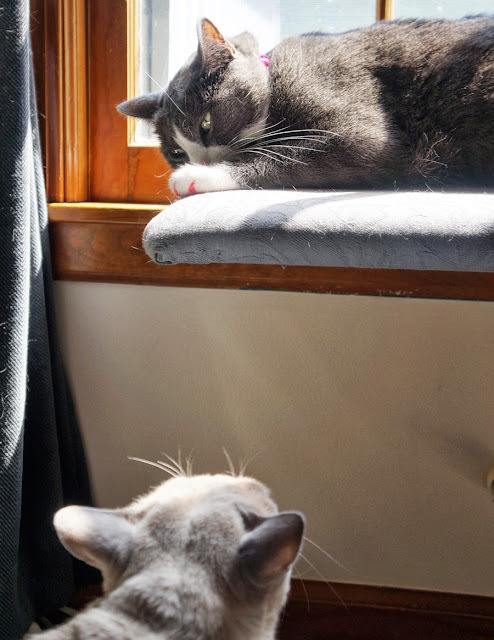 Faraday and Maxwell are actually a bit afraid to argue the point with her. 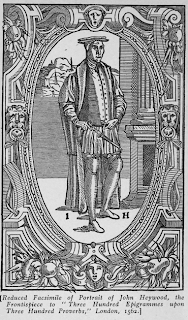 The Proverbs of John Heywood, John Heywood, 1546. Edited, with notes and introduction, by Julian Sharman. London, George Bell and Sons. York Street, Covent Garden, 1874. Page 13. 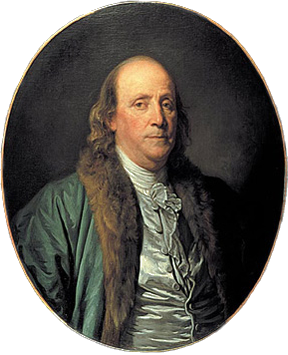 A Great Improvisation: Franklin, France, and the Birth of America. Schiff, Stacy, 2005. New York: Henry Holt. ISBN 0805066330. Page 236. "If you have a dog or cat that became ill after eating jerky pet treats, the Food and Drug Administration (FDA) would like to hear from you or your veterinarian. The agency has repeatedly issued alerts to consumers about reports it has received concerning jerky pet treat-related illnesses involving 3,600 dogs and 10 cats in the U.S. since 2007. Approximately 580 of those pets have died. To date, FDA’s Center for Veterinary Medicine (CVM) has conducted more than 1,200 tests, visited jerky pet treat manufacturers in China and collaborated with colleagues in academia, industry, state labs and foreign governments. Yet the exact cause of the illnesses remains elusive. To gather even more information, FDA is reaching out to licensed veterinarians and pet owners across the country. "This is one of the most elusive and mysterious outbreaks we've encountered," says CVM Director Bernadette Dunham, DVM, Ph.D.
"Our beloved four-legged companions deserve our best effort, and we are giving it." In a letter addressing U.S. licensed veterinarians, FDA lists what information is needed for labs testing treats and investigating illness and death associated with the treats. In some cases, veterinarians will be asked to provide blood, urine and tissue samples from their patients for further analysis. FDA will request written permission from pet owners and will cover the costs, including shipping, of any tests it requests. Meanwhile, a consumer fact sheet will accompany the letter to veterinarians so they can alert consumers to the problem and remind them that treats are not essential to a balanced diet. The fact sheet also explains to consumers how they can help FDA's investigation by reporting potential jerky pet treat-related illnesses online or by calling the FDA Consumer Complaint Coordinator for their state. Within hours of eating treats sold as jerky tenders or strips made of chicken, duck, sweet potatoes and/or dried fruit, some pets have exhibited decreased appetite, decreased activity, vomiting, diarrhea (sometimes with blood or mucus), increased water consumption, and/or increased urination. Severe cases have involved kidney failure, gastrointestinal bleeding, and a rare kidney disorder. About 60 percent of cases involved gastrointestinal illness, and about 30 percent involved kidney and urinary systems. The remaining cases reported various symptoms, such as collapse, convulsions or skin issues. Most of the jerky treats implicated have been made in China. Manufacturers of pet foods are not required by U.S. law to state the country of origin for each ingredient in their products. A number of jerky pet treat products were removed from the market in January 2013 after a New York State lab reported finding evidence of up to six drugs in certain jerky pet treats made in China. While the levels of these drugs were very low and it's unlikely that they caused the illnesses, FDA noted a decrease in reports of jerky-suspected illnesses after the products were removed from the market. FDA believes that the number of reports may have declined simply because fewer jerky treats were available. Meanwhile, the agency urges pet owners to be cautious about providing jerky treats. If you do provide them and your pet becomes sick, stop the treats immediately, consider seeing your veterinarian, and save any remaining treats and the packaging for possible testing. More than 1,200 jerky pet treat samples have been tested since 2011 for a variety of chemical and microbiological contaminants, from antibiotics to metals, pesticides and Salmonella. DNA testing has also been conducted, along with tests for nutritional composition. Inspections of the facilities in China that manufacture jerky products associated with some of the highest numbers of pet illness reports did not identify the cause of illness. However, they did identify additional paths of investigation, such as the supply chain of some ingredients in the treats. Although FDA inspectors have found no evidence identifying the cause of the spate of illnesses, they did find that one firm used falsified receiving documents for glycerin, a jerky ingredient. Chinese authorities informed FDA that they had seized products at the firm and suspended its exports. To identify the root cause of this problem, FDA is meeting regularly with regulators in China to share findings. The agency also plans to host Chinese scientists at its veterinary research facility to increase scientific cooperation. 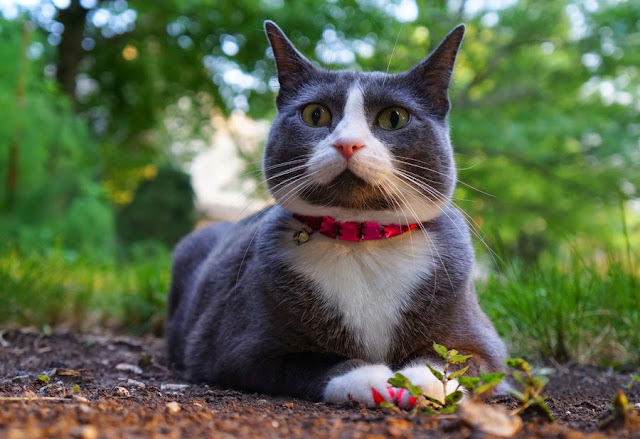 FDA has also reached out to U.S. pet food firms seeking further collaboration on scientific issues and data sharing, and has contracted with diagnostic labs. "Our fervent hope as animal lovers," says Dunham, "is that we will soon find the cause of—and put a stop to—these illnesses." This article appears on FDA's Consumer Updates page, which features the latest on all FDA-regulated products. Oct. 22, 2013"
"I loooove those Indian Summer days!" Yeah, that happens a lot around here....! 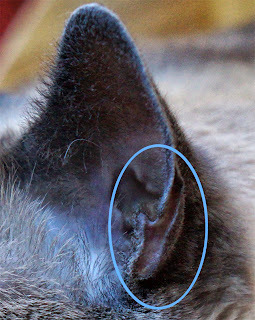 Monday Medical: What is that thing on my cat's ear? 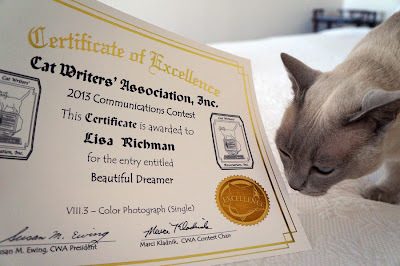 Amy over at Sebastian the Sensitive Soul asked if we’d write about that funny little flap at the base of a cat’s ear. What is it, and why is it there? It was so cool to have someone suggest a topic, and loads of fun to research! 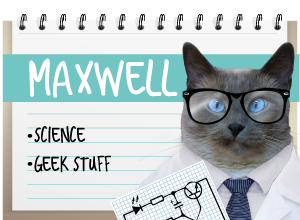 As many of you know, when we first adopted Maxwell we quickly discovered he was completely deaf. 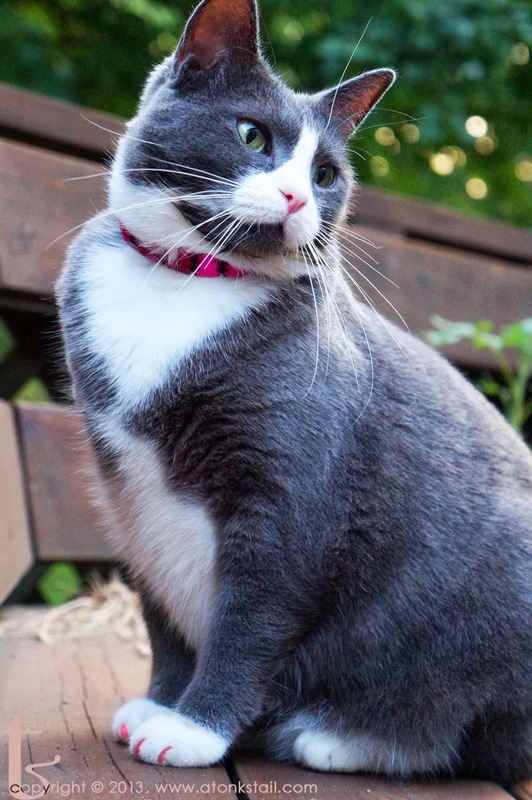 So the feline ear and how it functions has been of special interest to us. A cat’s ear is quite unlike the ones we humans are stuck with. You may have noticed, for instance, that theirs swivel whereas ours don’t. Not only do they have a good 180 degrees of movement, each ear can move independently. Thirty-two different muscles power each ear. Impressive, yes? 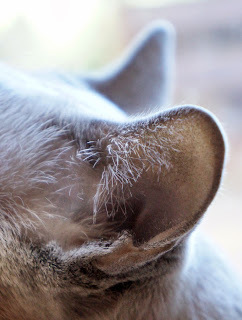 The most prominent part of a cat’s ear – the erect part, distinguished and elegantly arched – is called the pinna. 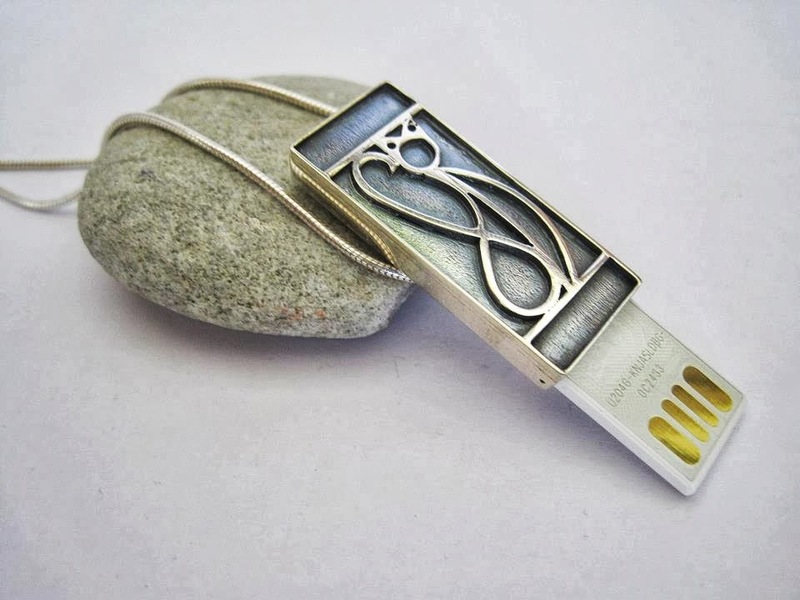 These pinnae are designed to draw sounds into the ear canal. Now those are some pretty fancy ‘dish antennae’! 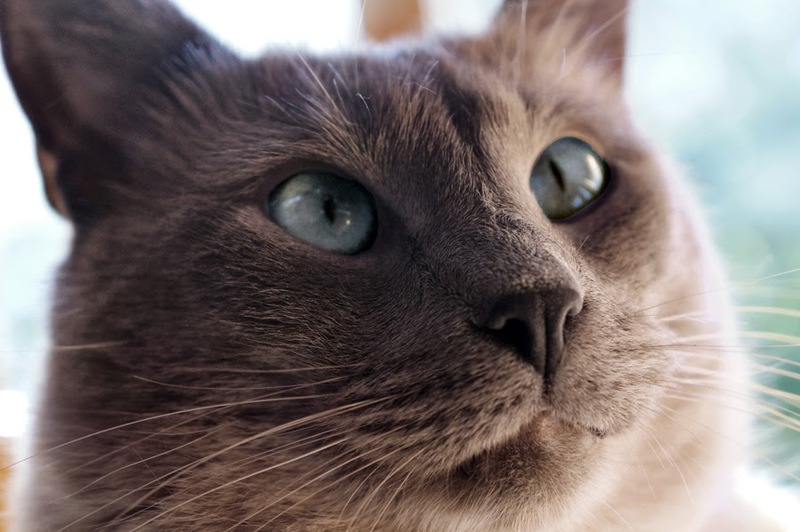 The range of a cat’s hearing is much broader than most animals, almost triple the range of humans and twice what dogs can hear. 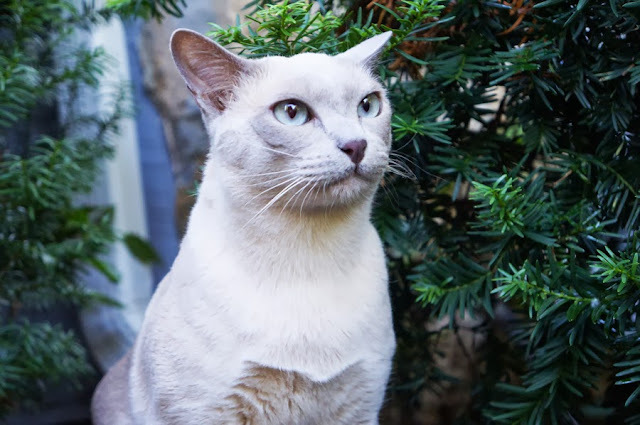 A cat’s hearing is especially acute at higher frequencies, which may have evolved in this manner because so many species in their food chain make sounds in that range. 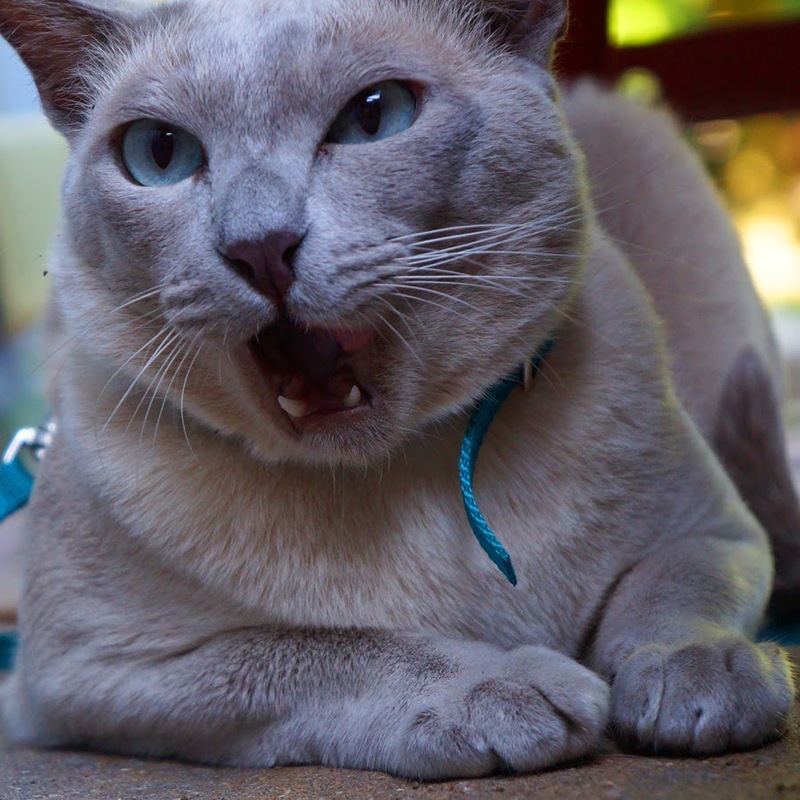 According to Dr. Steven Bailey, cats have 10,000 more auditory nerves than us humans. They can resolve the difference between two sounds with great clarity: from 6 feet away, they can distinguish between sounds that are only about 3 inches apart. And from 60 feet away, they can differentiate between sounds that are only a foot apart! Now what about that little flap at the outer base of each pinna? Well, it’s known as a cutaneous margin pouch. As for its function? Scientists aren’t entirely certain, but they suspect it plays a role in differentiating between various sound-waves. 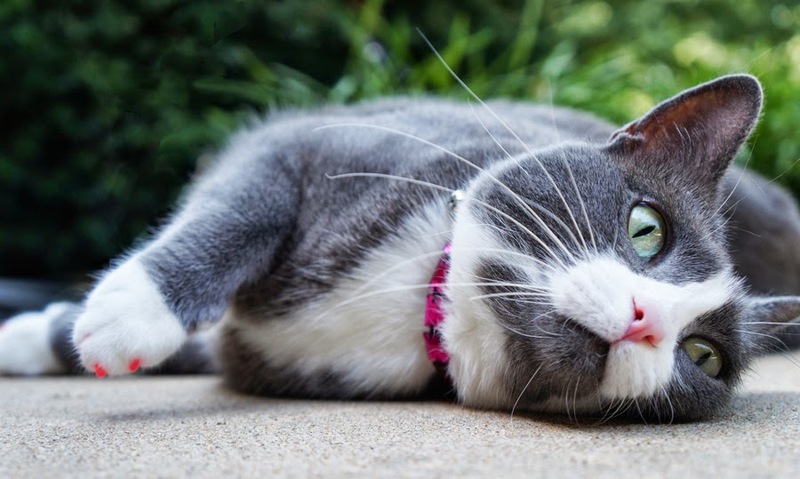 As highly engineered as these feline listening devices are, we don’t doubt it! "Oh, you don't really think I'm a hussy...do you?" We want to apologize for being scarce this week. Our mom has a heavy workload and a looming deadline, and we're pulling double shifts trying to purr some of her stress away! We promise to be back visiting all our friends in a few days! 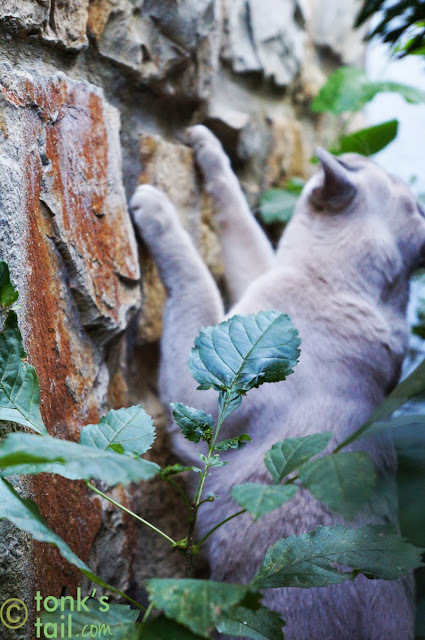 'scuse me while I zip right up this wall. Folks, don't try this at home! It takes a skilled rock climber like myself to attempt something of this magnitude! The 8 GB sterling silver flash drive necklace by Etsy artist egszeresz. It'll set you back a cool $164 USD, but you'll be styling and tech-savvy. Mommy'd better hope she wins the lottery soon - she just loves the elegant lines of this kitty! 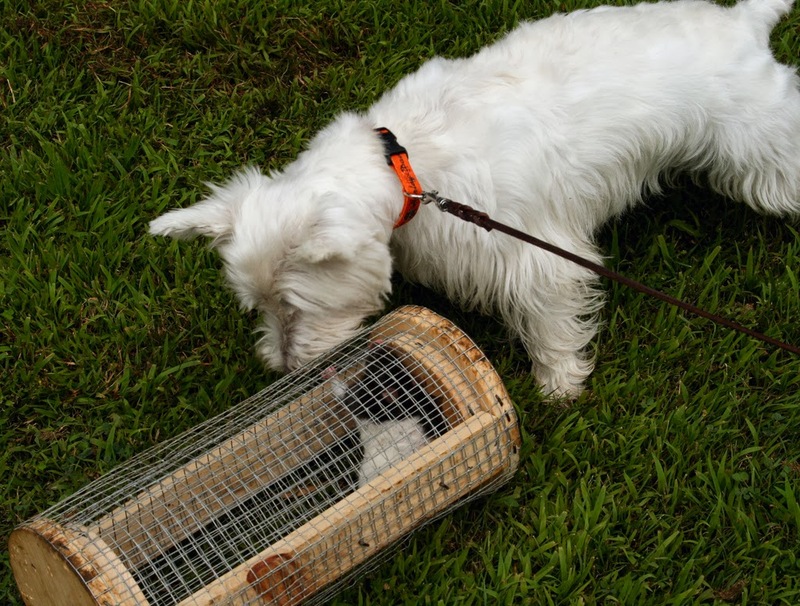 If one “smells a rat,’ he or she suspects that matters may not be as innocent as they appear on the surface. And the origins aren’t as clear as we’d like them to appear either. First, there’s the matter of experts disagreeing about who did the smelling: was it a cat or a dog? Terrier scenting a rat to "hunt". According to an old and venerable volume on etymology written in 1869 by William Blackley, the phrase is a mistranslation of an old German saying: unrath wittern, roughly meaning ‘I scent mischief’ was changed to eine ratte wittern, “ I smell a rat”. Everyone’s entitled to his or her opinion, of course, but we wanted to dig a bit deeper and see if there were other explanations, or if Palmer truly did have the final word on the matter! Robert Hendrickson, author of Facts on File Encyclopedia of Word and Phrase Origins, believed it to be a cat who scented the rodent. Regardless of which side you choose, the phrase has been around for quite a while (and we suspect, so has the dog/cat debate). "Two other cases the witness mentioned, in the first of which he alleged that the judge, in reference to an insufficiency of evidence said, 'I smell a rat; I don't believe the defendant or her witness.'" 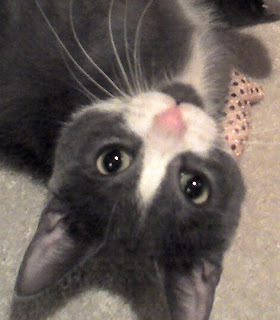 Faraday wants you to know that he’s certain he’d be able to suss out any rats that dared show a whisker inside our domain. How about yours? Any juicy rat-hunting stories? And – poll time! Are they from cats or dogs? Word gossip: a series of familiar essays, William Lewery Blackley, Oxford University, 1869. Folk-etymology: A Dictionary of Verbal Corruptions Or Words Perverted in Form Or Meaning, by False Derivation Or Mistaken Analogy, by Abram Smythe Palmer, George Bell & Sons, 1882. Patient Grissil, act iv. Sc.2 (December, 1599, published 1603) Public Domain. The County Courts Chronicle: Volumes 2717-2721 of Early English newspapers, J. Crockford, 1852. 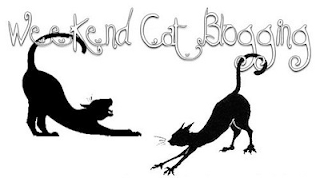 Many of you know artist Lou Belcher - or at least her cats, Bugsy and Knuckles, at the blog HH and the Boys. Well Lou set a "30 in 30" challenge for herself, wherein she painted a cat a day for a month. Allie was Day # 12. You can see the painting at this link here. And the photo below was the reference picture Lou used! 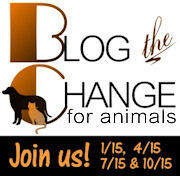 We believe in the power of change, which is why we enthusiastically support Blog the Change. And we pray that today's post gets the word out so that there is, indeed, change on this issue, worldwide. 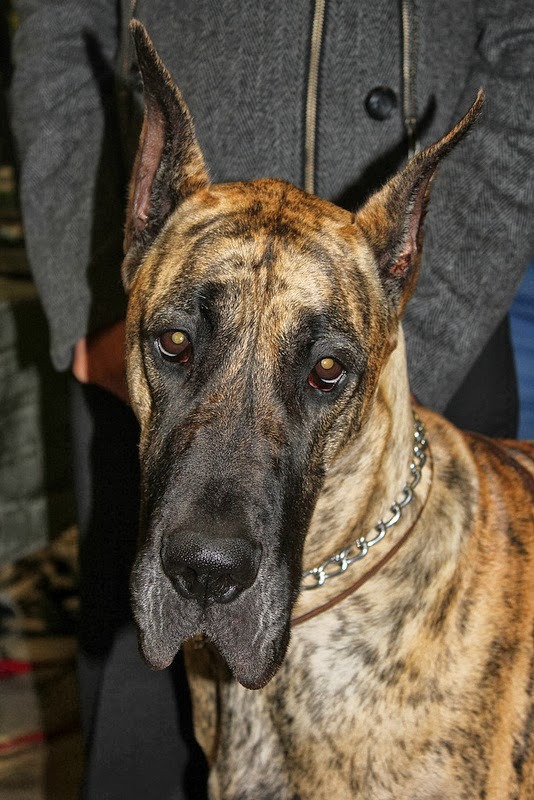 Early in 2012, a local story made national news: it was about a Great Dane named J Matthew. When J Matthew saw his mom beaten with a hammer, he thrust himself between her and the abusive man. As a result, they were both nearly killed. J Matthew’s human is certain that without his brave intervention, she would have surely died. J Matthew’s owner beat the odds – she left the abusive relationship. One of the reasons she was able to do so was due to a new policy at the Rose Brooks Center in Kansas City, Missouri. The shelter allowed her to keep J Matthew with her, once he was released from veterinary care. 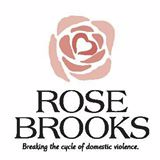 Rose Brooks is the only shelter in the Midwest region that will allow victims to bring pets with them. Many battered women refuse to leave abusive situations because domestic violence shelters will not make room for their beloved pets. In fact, according to nationally renowned animal and family advocate attorney Allie Phillips, almost half of domestic violence victims delayed or refused to leave the abusive situation out of fear they would have to leave their animals behind. This makes perfect sense when one considers that a pet is a source of comfort and unconditional love during a time of great distress. 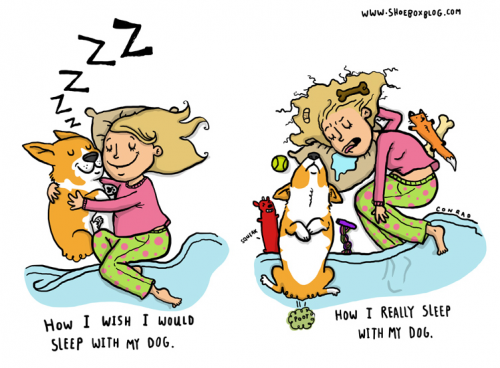 As we well know, our pets are family members. To leave without them under any circumstances is unthinkable. In this, a situation where a pet may be a touch-point of sanity in a world gone crazy-wrong? You can see why a victim might even choose homelessness over seeking assistance if that shelter won’t take their beloved friend in, too. 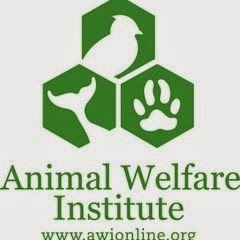 The Animal Welfare Institute hosts a list, searchable by zip code, of shelters in the U.S. that are considered Safe Havens. Sadly, most of these do not have on-site facilities to care for a victim’s pets. When they do, it’s big news. Just a few months ago the Urban Resource Institute launched New York City’s first ever co-sheltering program to enable domestic violence survivors and their pets to reside together in shelter. The project is currently in a six-month test. Allie Phillips has created the first and only global initiative that provides resources to shelters to help them get to the place where they, too, can offer what Rose Brooks and the Urban Resource Institute now provide: housing for families and their pets. The program is called SAF-T, Sheltering Animals and Families Together, and they offer a free start-up manual for any organization interested in providing this service to families fleeing abuse. Please join us in spreading the word. We hope in the near future to be able to report that many other places have followed the ground-breaking work of these fine people and organizations. 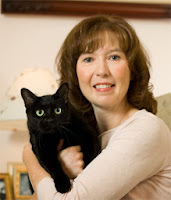 Kudos to Allie Phillips, and to Rose Brooks (and Wayside Waifs, the no-kill shelter that worked with Rose Brooks for over a year to help make their pets program a reality). 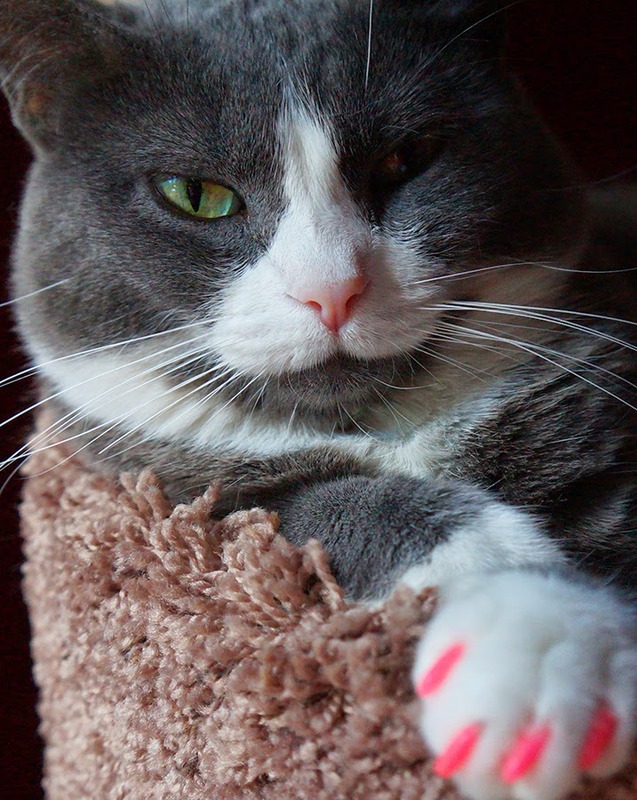 And we’re crossing our paws that the six-month trial in NYC becomes permanent. She was just sittin' there, looking all bossy and stuff. So I showed her who was in charge. A long overdue THANK YOU to Glogirly!